This article is about the video game. For the series, see Animal Crossing. Animal Crossing[a] is a life simulation video game developed by Nintendo EAD and published by Nintendo. It is a localised version of Dōbutsu no Mori, a Nintendo 64 title that was released in Japan on April 14, 2001. It was enhanced and re-released on the GameCube in Japan later that year as Dōbutsu no Mori+, which was localised worldwide as Animal Crossing. Another version, Dōbutsu no Mori e+, was released in Japan in 2003, adding the improvements made to Animal Crossing plus some additional features. Animal Crossing is an open-ended game in which the human player character moves into a village populated with anthropomorphic animals. Throughout the game, the player can interact with the animals, as well as other players through the GameCube's memory card. The game is synced with the GameCube's internal clock and calendar, allowing the game to be played in real-time, which also follows seasons and holidays. A screenshot of the overworld, featuring the player's character. The game features graphics from the Nintendo 64 version. Animal Crossing is a social simulation game, dubbed a "communication game" by Nintendo. It is open-ended, and the player's character can live a separate life with very little set plot or mandatory tasks. Players assume the role of a new resident to the town. The gender and looks of the character depend on answers given to a cat named Rover, whom the player meets on the train the character takes to the town. There are also tasks that players can complete and goals they can achieve. The game is played in real-time, observing days, weeks, months and years using the GameCube's internal clock. Many real-life events and holidays span the year, including Independence Day, Halloween, the Harvest Festival (Thanksgiving), and Toy Day (Christmas). Other activities such as fishing tournaments and early-morning fitness classes occur on a regular schedule. When players stop playing, they can talk to their Gyroid, a creature next to their house, to save their progress. If the player turns off the game or resets the GameCube without saving first, a mole called Resetti appears in front of the player's house the next time they play to scold them for resetting; what they achieved during the previous unsaved game is lost, but everything else is kept. One of the main goals of the game, given to the player during the game's opening cut scenes, is to increase the size of the player's character's house. This house is the repository for furniture and other items acquired during the course of the game. It can be customized in several ways, such as roof color, furniture, music, wallpaper and flooring. These customizations are judged by the Happy Room Academy (HRA). Tom Nook, a tanuki in the Japanese versions and a raccoon in the American and European versions, runs the local store. At the beginning of the game, he gives the player their first house with a mortgage of 19,800 Bells (the in-game currency). After paying the debt, part of which is done through a part-time job with Nook, the house is expanded, prompting another debt from Nook. The house is expanded several times during the course of the game. Players can sell basically anything to Nook in exchange for Bells. The village initially contains six villagers, and more villagers move in or out depending on the player's actions. There is a maximum of fifteen villagers living there at a time. All villagers are animals and each has a home that the player can visit. There are many possible interactions between the player and the villagers, including talking, trading items, completing tasks, writing letters, and, in e+, buying medicine for when they get sick. Villagers also interact with each other independent of player control. Players can collect up to fifteen Nintendo Entertainment System games in Animal Crossing, which are fully playable via emulation. North American releases are packaged with a memory card that automatically gives the player two games upon creating a game file. Others are acquired in various ways, such as gifts from villagers, hidden on the island, or via special giveaways from Nintendo's website. Seven of the titles were also available in the original Nintendo 64 release. ^a : Playable only in Dōbutsu no Mori+. ^b : Playable only in Animal Crossing and Dōbutsu no Mori e+. There are four additional NES games that are not obtainable through normal means in-game. In North America, two of these games, Ice Climber and Mario Bros., were exclusively released through the use of two e-Reader cards, which were never distributed in Europe or Japan. Japanese players received Ice Climber as a gift if they used a special service provided by Nintendo to transfer their save data from Dōbutsu no Mori to Dōbutsu no Mori+; this service has since been discontinued. Super Mario Bros. was distributed in Japan as a Famitsu prize to Dōbutsu no Mori+ players. The Legend of Zelda also exists and is fully functional in the game's code, but was never made officially available in any capacity. These four bonus games can be obtained using a cheat device in earlier GameCube releases, but were removed entirely from Dōbutsu no Mori e+. The "Advance Play" feature allows players to link a Game Boy Advance to the GameCube and temporarily download the NES game to the handheld. This is not available for games that were originally produced for the Family Computer Disk System, such as Clu Clu Land D and The Legend of Zelda, or are larger than 192 KB, such as Punch-Out!! and Wario's Woods, as they cannot fit into the GBA's RAM. All other games can be played via Advance Play, but multiplayer functionality is not supported and their graphics appear slightly squashed on the GBA's display (as in PocketNES) due to its smaller vertical resolution. There are three types of multiplayer gameplay. In one method, up to four players can create their own houses in a single village. No two players can play at the same time, but by taking turns, they can each affect the village in their own ways, communicate with each other via the town board and mail, and share in the experiences of the village. Another multiplayer option is simultaneous play with two players. This requires two controllers and a multiplayer NES game. After setting up the system with two controllers, the players are able to select the NES game they want to play. Once the game is started, players can select the two-player option and start playing multiplayer. The third type of multiplayer play consists of trading items with another player using a system of codes. Tom Nook operates a system through which a player can "ship" an item to another player in another town. The player hands an item to Tom Nook and specifies the recipient's name and town, and Tom Nook gives the player a 28-character code. In the other town, the player tells the code to Tom Nook and receives the item. Another way to trade items is to travel to a friend's town and drop the item the player wants to give them. This prevents the loss of the item code which must be memorized or written down. This game has a traveling system that allows one character to visit a friend's village. This system requires an additional memory card with this game's data, and three blocks of memory to save "travel data". Players go to the train station and tell Porter they want to take a trip. The train will arrive and they board it. This saves "travel data" on the other memory card. Players then arrive at the other town. If a player turns off the console in another town or while they are on the train, the next time they play, the player's eyes will be temporarily replaced with the face seen on the Gyroid outside their home (this face is colloquially referred to as a "missing face" due to its blank orifices resembling a facial template), and all the player's items in their inventory (including their Bells) will be gone; Mr. Resetti will not appear under these circumstances. Travelling can be done in several ways. In the N64 version, two Controller Paks are required to travel: one to save travel data, and the other to access the destination town. In the GameCube release, the player can travel to a town on a memory card in Slot B or in Slot A on a second Gamecube; the second method allows the game to be run on both consoles simultaneously. Players can meet new villagers, shop at Tom Nook's store (which will most likely have a different stock; identical stocks between towns are possible but are very rare), shop at the Able Sisters (which may have different patterns depending on the friend's choice of display) and do almost anything else that they can do in their own town. There are only a few things visitors cannot do, and they all center around the idea that the character is visiting another town. The character does not have the same privileges and does not receive the same services that they would in their own town. For example, another town's Tom Nook will not travel to paint a roof, which means players cannot buy paint in another town. After visiting another town, one of the villagers may move to the visited town. If the visited town has a full fifteen villagers, this will prompt someone from the visited town to move away. Depending upon how many memory cards a player or their friends own, there can be many other villages to see and different items to find. Villagers can move even if none of the user-created characters travel to another town. If a memory card for another town is in the second slot in the GameCube, when a villager leaves, they move to the other town instead of just moving out. If a player interacts with a villager who has moved away from his or her town to the one he or she is visiting, the villager will remember the player. Items can be traded by dropping the item outdoors in one's friend's town or through a Gyroid. For items that cannot be dropped, the item must be placed for sale or given away through the Gyroid. The Gyroid can only hold up to 4 items at a time. Game Boy Advance connectivity plays a role in Animal Crossing, using a Nintendo GameCube – Game Boy Advance link cable. Each town has a tropical island which can be accessed by plugging in a Game Boy Advance with a GameCube link cable. A character called Kapp'n ferries the player to the island for free. An exclusive animal roams the island, whom the player can become friends with. The island has an exclusive type of fruit, coconuts. The player can also decorate a small communal beach house and fish at the shores. 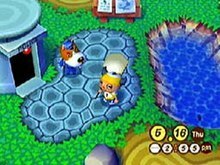 On leaving, the player can download the island to a GBA and give fruit to the villager, who drops Bells; if the player then returns to the island, they can pick up the money that has been dropped. Players can also leave the islander tools to use, such as the shovel or net. Downloaded islands can also be traded between GBA's, using a Game Boy Advance Link Cable. The Game Boy Advance can also be used when shopping at the Able Sisters. The pattern design tool can be downloaded to a Game Boy Advance, and the player can then upload designs made on a Game Boy Advance to the GameCube. This feature can be accessed by plugging in a Game Boy Advance with a GameCube Game Boy Advance Cable and talking to Mabel in the Able Sisters shop. The development of the game was started on 64DD as a vehicle to take advantage of the real-time clock on the system. The development was moved to Nintendo 64 after 64DD's extended delays, and featured an integrated real-time clock inside the game cartridge. Kazumi Totaka served as the game's sound director. Kenta Nagata composed background music for the fields, Toru Minegishi for the indoor areas and Shinobu Tanaka for the events. The game was originally released as Dōbutsu no Mori on the Nintendo 64 in Japan in April 2001. The game was ported to the GameCube as Dōbutsu no Mori+, released on December 14, 2001 in Japan, eight months after the original game. This version contains extra features that were originally left out in the Nintendo 64 version, and also uses the GameCube's built-in clock to keep track of the date and time. With the use of the GameCube's clock, the passing of time affects the game, even between play sessions. This led to the game's slogan, "the real life game that's playing, even when you're not". Dōbutsu no Mori+ cost 7,140 yen and sold 92,568 copies during its first week of sale in Japan. When Nintendo began localizing Dōbutsu no Mori+ for release in North America as Animal Crossing, the game underwent an immense translation project, which resulted in much more text than the Japanese version. Not only did thousands of lines of text have to be translated, but translators Nate Bihldorff and Rich Amtower had to create new holidays and items. Nintendo Japan was so impressed with the work done by Nintendo of America's Treehouse division that they added NOA's content back into the Japanese version and released it as Dōbutsu no Mori e+ along with some added new content of their own. It was released in Japan on June 27, 2003, and sold 91,658 copies during its first week of sale. Upon its release, Animal Crossing was subject to critical acclaim. It was named the seventh best game of all time on the GameCube by the television show X-Play on the television network G4. On IGN, the game holds an "outstanding" 9.1 rating. Some critics praised the game's use of the GameCube's internal clock and calendar and its inclusion of hidden NES games, however others, such as IGN's Peer Schneider, criticized its audio and visuals, for being below-standard quality for a GameCube title. According to the review aggregator site Metacritic, the game received a score of 87 out of 100, indicating "generally favorable reviews" based on 42 critics. According to GameRankings, the game received a score of 86% based on 72 reviews. The game was a commercial success, selling more than 2 million copies worldwide. By July 2006, it had sold 1.3 million copies and earned $43 million in the United States. Next Generation ranked it as the 37th highest-selling game launched for the PlayStation 2, Xbox or GameCube between January 2000 and July 2006 in that country. It is one of the best-selling Nintendo GameCube games. Animal Crossing was also rated the fifth-best GameCube game by ScrewAttack on their "Farewell to the GameCube, ten GameCube games" list, saying, "It's a game that plays even when you're not and can last up to 30 years!" 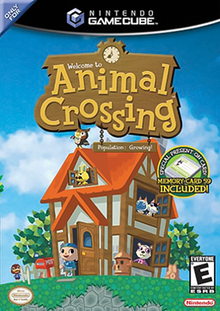 The popularity of the series inspired the creation of an animated film based on the game's sequel Animal Crossing: Wild World, which was released exclusively in Japan. The game received awards for Innovation in Console Gaming, Outstanding Achievement in Game Design, Console Role-Playing Game of the Year and was nominated for Console Game of the Year, Console Role-Playing Game of the Year, Game of the Year, Innovation in Console Gaming, Outstanding Achievement in Game Design, and Outstanding Achievement in Gameplay Engineering all by Academy of Interactive Arts & Sciences. ^ "Animal Crossing Review". GameSpot. Archived from the original on October 2, 2013. Retrieved November 14, 2013. ^ "The Inside Story of Animal Crossing". Edge. Future plc. August 29, 2008. Archived from the original on October 17, 2013. Retrieved October 17, 2013. ^ "Development summary". N-sider. Archived from the original on October 17, 2013. Retrieved October 17, 2013. ^ a b c Nintendo Co., Ltd. (September 15, 2002). Animal Crossing. GameCube. Nintendo of America, Inc.
^ "Animal Forest". N-Sider.com. Archived from the original on June 10, 2011. Retrieved November 14, 2013. ^ "The Evolution of Animal Crossing". IGN. November 12, 2008. Archived from the original on January 6, 2016. Retrieved May 30, 2015. ^ "Animal Crossing". N-Sider.com. Archived from the original on October 2, 2012. Retrieved November 14, 2013. ^ a b "Animal Crossing for GameCube". GameRankings. CBS Interactive. Archived from the original on October 2, 2008. Retrieved September 26, 2018. ^ a b "Animal Crossing for GameCube Reviews". Metacritic. CBS Interactive. Archived from the original on September 10, 2008. Retrieved September 26, 2018. ^ ニンテンドウ64 - どうぶつの森. Weekly Famitsu. No.915 Pt.2. Pg.32. June 30, 2006. ^ ニンテンドーゲームキューブ - どうぶつの森+. Famitsu. No.915 Pt.2. Pg.96. June 30, 2006. ^ FENNECFOX (September 16, 2002). "Animal Crossing (GCN) review at GamePro". ICG Entertainment. Archived from the original on October 20, 2002. Retrieved August 26, 2002. ^ Matthew Gallant (September 16, 2002). "Animal Crossing (GCN) review at Gamespot". GameSpot. Archived from the original on April 9, 2009. Retrieved August 26, 2008. ^ a b c Peer Schneider (September 5, 2002). "Animal Crossing (GCN) review at IGN". IGN. Archived from the original on September 27, 2008. Retrieved August 26, 2008. ^ "Best GameCube Games Ever: #7-5 Videos". G4tv.com. July 7, 2006. Archived from the original on March 9, 2013. Retrieved November 14, 2013. ^ "US Platinum Videogame Chart". The Magic Box. December 27, 2007. Archived from the original on April 21, 2007. Retrieved August 3, 2008. ^ "The RetroBeat: Examining the GameCube's 10 best-selling games in the U.S." VentureBeat. December 12, 2018. Retrieved January 29, 2019. ^ "ScrewAttack's Top Ten Video - ScrewAttacks GameCube Farewell - Top Ten GameCube Games". ScrewAttack's Top 10. YouTube. Archived from the original on April 25, 2016. Retrieved February 18, 2018. ^ "2007年度興行成績ランキング" (in Japanese). Rakuten. Archived from the original on October 29, 2012. Retrieved January 29, 2019. ^ "Animal Crossing Awards". Academy of Interactive Arts & Sciences. Archived from the original on March 25, 2014. Retrieved May 11, 2014. This page was last edited on 20 April 2019, at 22:28 (UTC).